All Web addresses mentioned were functional as of 6-12-15. From the Cumberland Gap to the Atlantic Ocean, this is Virginia Water Radio for the week of June 15, 2015. This week, that short taste of “Dirty Sea,” by the Charlottesville and Nelson County-based band Chamomile and Whiskey, sets the stage for one of the most serious water subjects: boating under the influence of alcohol. We start with some start musical metaphors to help describe why alcohol and boating don’t mix – first from “Dirty Sea,” then from “River Song,” by the Blacksburg and Roanoke-based band The Floorboards. Have a listen for about 50 seconds. According to U.S. Coast Guard, alcohol is the leading contributing factor in fatal recreational boating accidents where a cause is known, contributing to about 21 percent of such fatalities nationwide in 2014. Alcohol’s bad for boating for many reasons: it can impair balance and coordination, slow reaction time, affect judgement, and decrease one’s ability to swim. Judgment, reaction, and coordination obviously affect boat operators, but they also help boat passengers, such as in making the crucial, good decision to wear a life jacket, and in reducing the chances of falling overboard, one of the leading causes of boating-related drownings. For all of these reasons, Operation Dry Water exists. 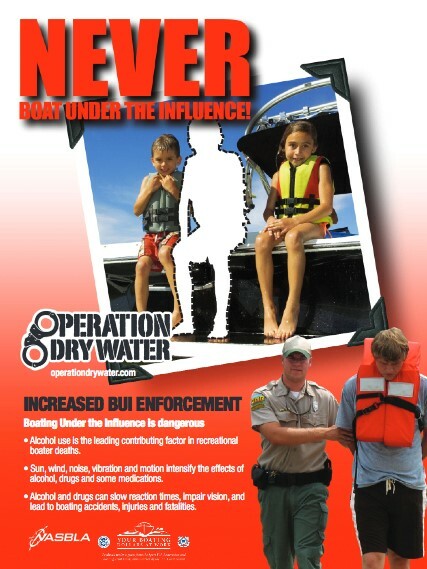 Coordinated by the National Association of State Boating Law Administrators, Operation Dry Water is a year-round, nationwide effort of boater education and law enforcement to reduce Boating Under the Influence—or BUI. Each summer on the weekend before July 4th, Operation Dry Water coordinates a special BUI focus by law-enforcement agencies. So this year from June 26 to 28, state, local, and Coast Guard officers will increase patrolling for BUI. Operation Dry Water’s Web site states that “the mission...is to change the cultural acceptance of drinking and boating and help boaters have safe and fun recreational boating experiences.” Here’s to that. “Dirty Sea,” from the 2013 album “Wandering Boots,” is copyright by Chamomile and Whiskey and by County Wide Records, used with permission of Chamomile and Whiskey. More information about Chamomile and Whiskey is available online at http://www.chamomileandwhiskey.com/, and information about Charlottesville-based County Wide Records is available online at http://countywidemusic.worldsecuresystems.com/. The excerpt of “River Song” was taken from a live performance by The Floorboards at the Cary Street Cafe in Richmond, Va., on December 13, 2013; used with permission. The recording was accessed from The Floorboards’ page on Internet Archive, https://archive.org/details/TheFloorboards. More information about The Floorboards is available online at http://thefloorboards.net/. Promotional poster provided by Operation Dry Water, online at http://www.operationdrywater.org/awareness. Over 200,000 recreational vessels—including these on Claytor Lake in Pulaski County, Va., in September 2012—have been registered in Virginia annually since at least 1992, according to the Virginia Department of Game and Inland Fisheries 2012 report on recreational boating accidents, online at http://www.dgif.virginia.gov/boating/2012-accident-report.pdf. The Virginia Department of Game and Inland Fisheries’ (VDGIF) 2012 report on recreational boating accidents indicated that alcohol contributed to 7 percent of that year’s fatal boating incidents. National Association of State Boating Law Administrators, “Operation Dry Water” Web site, http://www.operationdrywater.org/. See particularly “ODW Campaign,” online at http://www.operationdrywater.org/content.asp?admin=Y&contentid=139; or “Operation Dry Water Campaign Reminds Boaters to Stay Safe by Staying Sober While Boating,” 5/18/15 news release, 5/18/15, online (PDF) at http://www.operationdrywater.org/files/News/ODW2015_NatlSafeBoatWeek.pdf. Participating agencies are listed by state and territory at this link: http://www.operationdrywater.org/agencies. National Safe Boating Council, “National Safe Boating Week” (May 16-22, 2015; May 21-27, 2016), online at http://www.safeboatingcampaign.com/. U.S. Coast Guard, Boating Safety Division Web site, http://www.uscgboating.org/. The Coast Guard’s “2014 Boating Recreational Statistics” report is online (as PDF) at http://www.uscgboating.org/library/accident-statistics/Recreational-Boating-Statistics-2014.pdf. Virginia Department of Game and Inland Fisheries (VDGIF), “Boating,” online at http://www.dgif.virginia.gov/boating/; “Boating Safety and Education,” online at http://www.dgif.virginia.gov/boating/education/requirement/; “Boat Safe Without Drugs and Alcohol!”, online at http://www.dgif.virginia.gov/boating/education/boating_class_oui.html. VDGIF’s “2012 Recreational Boating Incident Summary” is online (as PDF) at http://www.dgif.virginia.gov/boating/2012-accident-report.pdf. The main phone number for VDGIF’s central office in Richmond is (804) 367-1000; contact information for local VDGIF offices is available online at http://www.dgif.virginia.gov/about/offices/, and local office phone numbers are usually listed in the government pages of local phone directories. Virginia Marine Resources Commission, “Boating Safety,” online at http://mrc.virginia.gov/mp/boating_safety.shtm. For previous episodes on boating in Virginia, please see the “Recreation” category” category at the Index link above (http://www.virginiawaterradio.org/p/index.html). WG.10 – cooperation among political jurisdictions to solve problems and settle disputes.